Beauuuutiful!! A true labor of love that you'll enjoy for a very long time!! 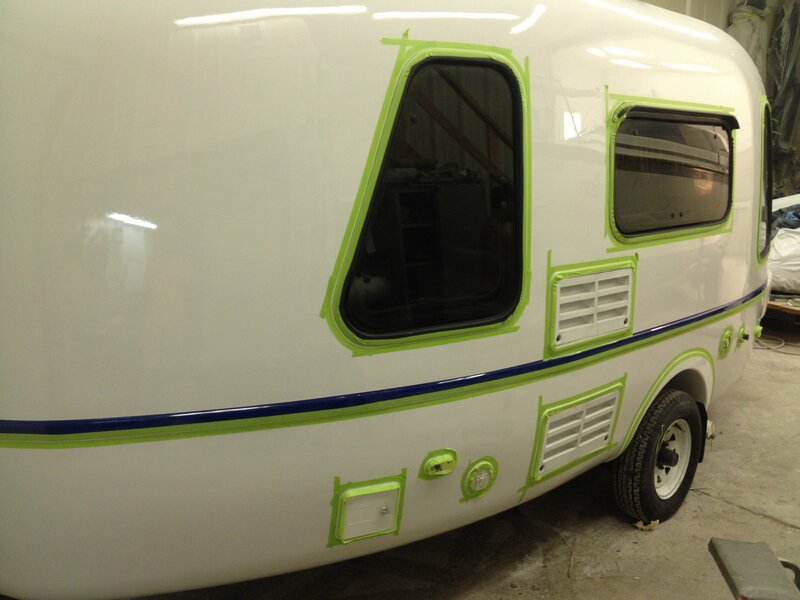 The paint job on our trailer was completed by Kim Anderson, owner of Dockside Marine located in Waterdown, Ontario. Kim has 30 years experience working with fiberglass. Comments from Kim: All the masking done in preparation for caulking. This is the second time the entire trailer gets masked. It's all in the details. Wow, this is a great paintjob! I have a 2001 oxygen which appears to have all original exterior. No delamination, just a few spyder web at some spots. 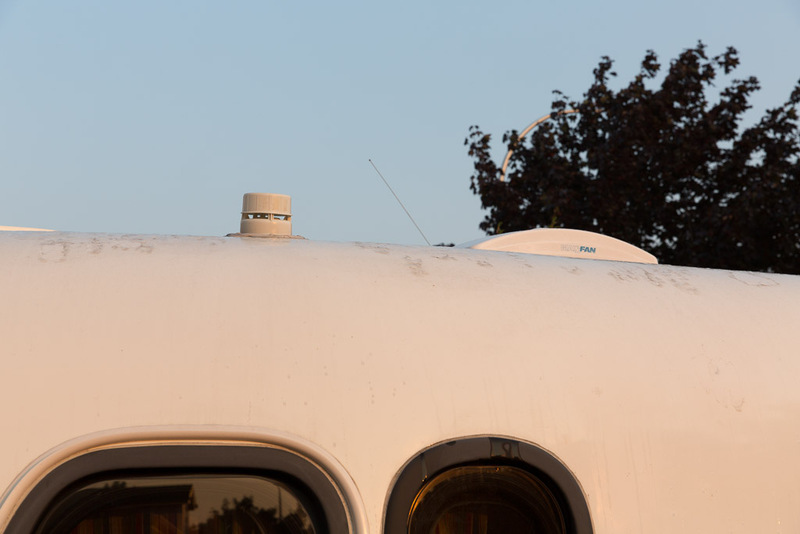 More pics of my Bonair Oxygen 2001. Why did you split the mattress at the bed access. Is it because of the storage you rearranged? Can you show pix of what you did underneath there please? I would like to figure out if we can split the base enough to have a space to swing my legs to the floor and shuffle out of bed. The bed as it is involves too much knee action for me now. I agree with the replies here - that FGRV is absolutely beautiful!! The shape, the windows, the interior. SWEET FGRV!!!! Congrats on the restoration! Thanks for sharing! To answer your questions, yes, we're happy with the final look of the trailer. To us it looks close to brand new. The paint job is not factory perfect, but it's very good and a big improvement over what we had. I sanded off the old clear coat, paint, and primer that covered the original gelcoat. This is what Kim Anderson from Dockside Marine said would be necessary since the clear cost was breaking down and did not provide a stable bonding layer. I added some more photos of the peeling clear coat problem to give you a better idea of what we were dealing with. If you have just gelcoat on your trailer, I'm pretty sure there are marine paints available that can be applied directly to the gelcoat after it has been throughly cleaned. No sanding will be required. I did the 90 hours of sanding because it cut our cost in half. 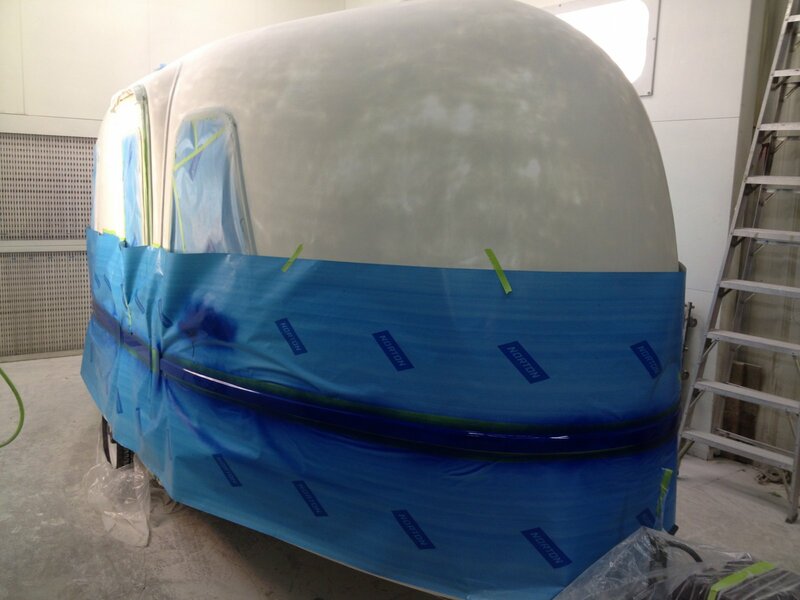 Prep work is more important and time consuming than the actual paint work. I highly recommend spending the extra money to get a marine paint. It will stand up to the elements much better. Kim suggests I may get 20 years out of this paint job. We paid about the same as one would pay for a trip to Disney World for a family of four for one week. 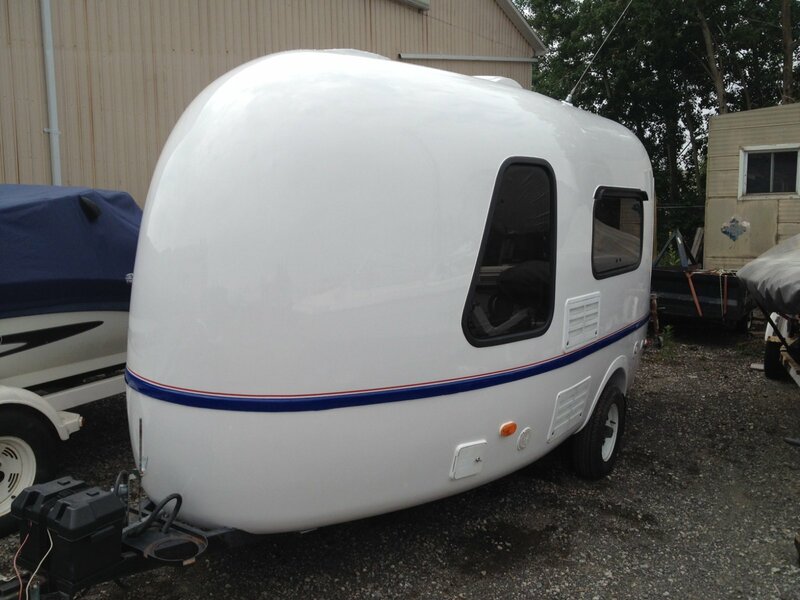 Yes pricy, but it looks like a new trailer and should look good for years to come. The job included a high-build marine primer to smooth out the imperfections in the sanding marks on the original gelcoat, sanding the high-build primer smooth after application, the white marine paint, the blue painted seam, and all chalking redone (around windows, and seams.) Since you have your original gelcoat intact, your costs should be lower. Find a reputable marine paint shop in your area and be prepared for the cost shock. It's more than triple the cost of painting a car. Thanks very much for the kind comments Joe. It was a labour of love. We're hoping to build many years of family memories with it. We split the cushions to make access to the under bed storage area easier. We have two access panels to the under bed storage, one under each cushion. I think this is pretty standard on all Oxygens, but I could be wrong. Our trailer is in winter storage right now but I'll try to get a picture of it to give you a better idea. As far as under bed storage changes go I spilt the storage access area on the countertop side of the trailer into separate forward and back storage areas. I didn't like the idea of items sitting next to the hot water heater and on top of the plumbing. I'll send pictures soon. It's too difficult to describe. I feel the changes made better use of the available space and secured items a little better. It also provided better support under the access panel. I noted that the weight of my body on the access panel caused the panel to flex. I guess I could stand to lose a few pounds. Thanks for sharing the pictures of your Oxygen. 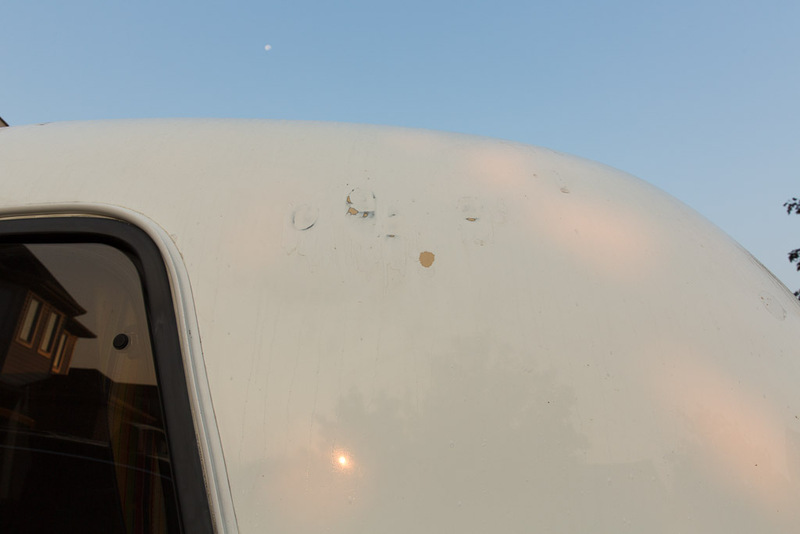 I remember that taking the old decals off the trailer is a long, slow, and somewhat frustrating experience. I found that careful use of a hair dryer to heat the decal adhesive and using your fingernails or a plastic scraper seemed to work to pull off the old decals cleanly. The striping above the seam was by far the most difficult to pull off. Cleaning off the adhesive under the vinyl seam trim was also challenging.